Hydrodynamic racing cap with 100% silicone for extra comfort! Zoned 3-D shape creates a hydrodynamic fit. Available in two sizes for optimum fit. Smooth, latex free silicone reduces drag. Logo size meets NCAA and high school regulations for competition. 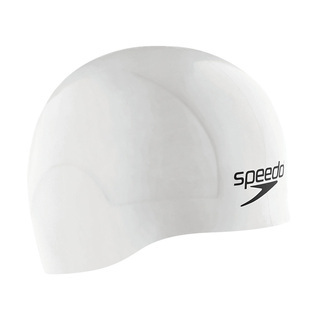 Wear this cap with Speedo LZR Racing Swimsuit for a quality racing experience! I never wore bathing caps after experiencing latex caps. I find that latex caps pull on my hair and are uncomfortable. 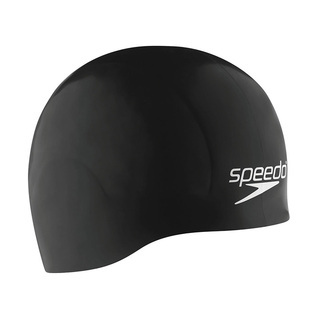 This Speedo silicone cap does not pull on my hair and is very comfortable. My hair is much softer since I started using it. I bought this cap when swimming at a local meet. It works great! There is absolutely no wrinkles, which reduces drag, it is very comfortable. It feels weird having that thick strip down the middle very thick and to the left and right of that very thin. Overall, I think that this is a very good cap in terms of speed.